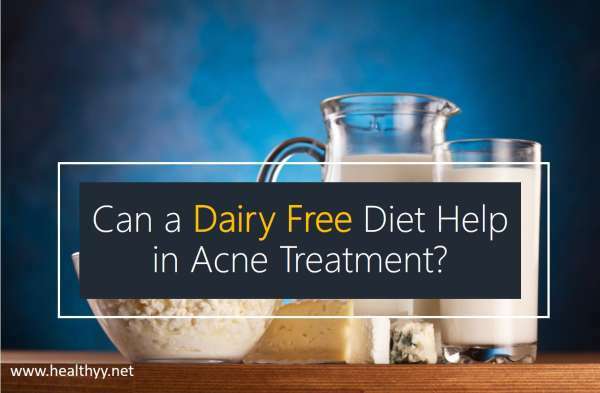 Can a Dairy Free Diet Help in Acne Treatment? Acne is one of the most common chronic skin disorder affecting millions of people across the globe. It is characterized by the outbreak of pimples, whiteheads, blackheads and inflammations along with redness and marks on the skin. It mostly stays limited to the face and neck region. Acne breakouts often cause psychological morbidity resulting in depression, anxiety and stress along with poor self image and low self confidence. With age and over time, a lot of new medicines have been developed to prevent, if not completely cure, the problem of acne. These include medicines like anti biotic, anti retinoid, oral contraceptives and accutane. However on way in which this can be approached is not by taking in extra things but by restricting certain things in your diet. This article will discuss the effectiveness of cutting out on dairy products to affect reduction in acne breakouts. What is Dairy free diet? It simply means what it says, which is excluding all dairy products like milk, yogurt, cheese, etc from your daily diet. Doctors usually recommend this kind of diet to people who are exhibit lactose intolerance, symptoms of irritable bowel syndrome. It is also selectively followed by fruitarians and vegans sometimes. Dairy products are usually said to have a lot of health advantages and provide you with essential nutrients like calcium and various vitamins. However, some research has also shown their negative impact on the health of a person. Such negative impact includes risks of certain cancers, arthritis pain and acne breakouts among others. Though there is a lack of scientific study on this topic, there have been theories evolved by doctors and researchers that establish a clear link between the consumption of dairy products and acne breakouts. This connection is backed by several reasons. Firstly, it is believed that the milk of a cow contains hormones that stimulate the sebaceous glands to secrete more sebum. Such hormones are linked to testosterone. This stimulation of the production of sebum or oil is one of the main contributors towards acne breakouts. It is believed that dairy products often lead to hormonal imbalance. Secondly, when milk enters the stomach, it converts into acidic which hampers the natural detoxification process and can thereby interrupt the natural improvement in the healing of the breakouts because of its toxicity. Furthermore, when taking in large amounts, dairy products tend to stimulate the release of insulin. This high level of insulin is known to have increased body’s inflammatory reaction which means that there will be increased chances of acne inflammation. .
Let’s discuss the different kinds of milk and determine if it is safe and if it will contribute towards the breakouts. Hormone fHormone-freeorganic milk simply means that there is no externally added hormone in the milk, while it still contains the internally produced hormone by the cow during secretion.It is therefore not advised to consume such type of milk when trying on a diet for acne prevention as it may still stimulate oil production. Raw milk or raw dairy product is simply not pasteurized but still contain the hormones that trigger insulin and therefore sebum secretion and is as unfit as normal milk. Lactose milk is similar to regular milk with only one exception that it, it has externally added lactase, an enzyme that facilitates digestion of lactose. Issues with taking it while trying to cut out of dairy products for risk of breakouts are still the same. Goat and sheep milk also contains growth hormones that can likewise stimulate release of insulin. It is better to avoid this while cutting out on dairy products. Though yogurt is a probiotic and the process of fermentation has removed a lot of ingredients, it still might contain some of the hormones from milk and can contribute towards the breakout in the same way. It is therefore advisable to avoid it. Organic almond milk preferably without sugar. Organic coconut milk without sugar. Organic coconut milk with full fat. The first phase requires complete abstention from dairy products. This will reduce the development of new blocked pores and the phase shall last for 6 months. The second phase allows you to cheat on the diet plan from time to time. In this phase you can take in items with low dairy content once in a while. The third phase requires you to start reusing the dairy products bit by bit while at the same time controlling uncontrolled consumption. Milk is one product that people are allergic to around the world and refraining from it can save you of various allergic reactions. Allergic reactions to milk might affect the gastrointestinal tracts specifically. Refraining from dairy products helps in the digestive process, even as a lot of cases of IBD have emerged because of the consumption of dairy products. Dairy free diets contribute towards weight loss as most dairy products are high in fat content. According to a study, dairy free diet reduces the risk of prostate and ovarian cancer. It can lead to calcium deficiency. For this it is advised that you must ensure a reliable source of calcium in take before going forward with this diet plan. It can lead to the deficiency of vitamin A or vitamin D.
It can cause a deficiency of protein in your body. It is important that your find other sources of such nutrients like calcium and protein which you would otherwise get from milk and other dairy products. You must not make your body deficient of it. There is not much clinical evidence to support the link between dairy food and acne breakouts. It is therefore better that you consult your doctor before going forward with this diet. Cystic acne: Cutting out on dairy in take proved effective for a lot of consumers who were suffering from cystic acne. No breakouts: Many consumers reported a 100% prevention of acne breakout after they had cut out on dairy products. Though this was experienced by a majority of people, it must be ensured that this might not be true for everyone. Weight loss: Some consumers experienced drastic weight loss after they had stopped consuming dairy products. It is however advised that you must ensure some other source of gaining the same nutrients that milk provides before cutting out on dairy in take. A dairy free diet is helpful not only in maintaining the health of the skin but also helps towards maintaining general bodily health in a lot of ways. It will also help you in losing weight. Cutting out on dairy will reduce the risks of acne breakouts by changing its cause factor development in general. It does not have a lot of side effects and is any day better than ingesting pills that will only lead to further side effects. Can Vitamin D Really Help in Fighting Acne & How to Use? Previous articleInterval Training for Weight Loss: Benefits & 4 Ways to Start Today! Can Primrose Oil Help in Acne Treatment?